The Basket Stinkhorn (Dictyophora indusiata) can be found in our nature reserves. However, to encounter this beautiful mushroom, one has to go out early, as the netlike white veil will collapse and rot off by noon. The putrid odour emanating from this mushroom attracts flies, carrion beetles and the occasional butterfly. 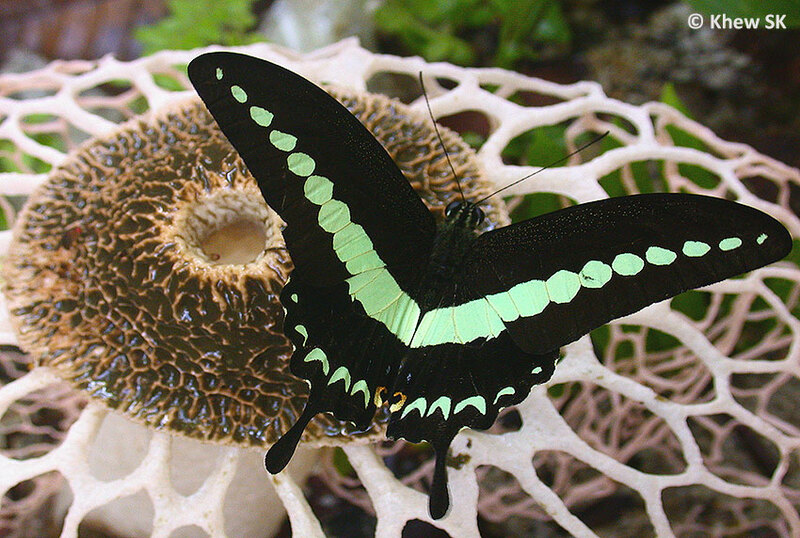 The Banded Swallowtail shown here, was photographed feeding on the bulbous head of the Basket Stinkhorn. 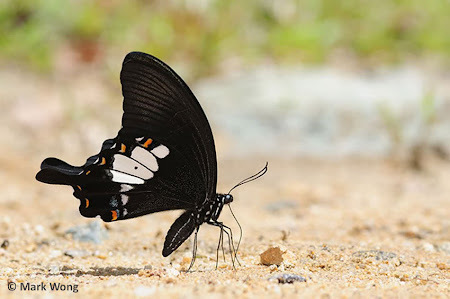 It returned repeatedly to the mushroom to feed and was 'tame' enough to be photographed although it flapped its forewings continuously as it fed, typical of the Papilio species. 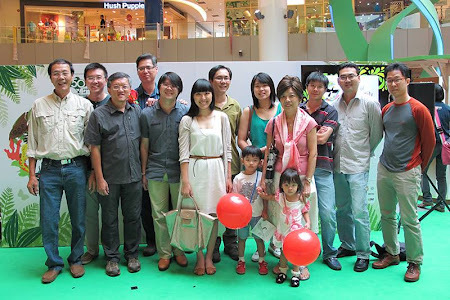 Read more about the Stinkhorn mushroom at the Bird Ecology Study Group's website where Dr Wee Yeow Chin elaborates about this species of mushroom found in Singapore's forests. The Sumatran Sunbeam is one of two species of the genus Curetis that exists in Singapore. 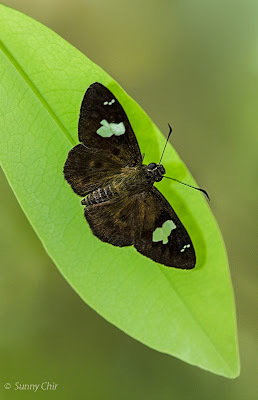 Although other species were recorded before, they remain elusive and besides the Malayan Sunbeam (Curetis santana malayica) the other species recorded by the early authors have not been reliably identified yet. 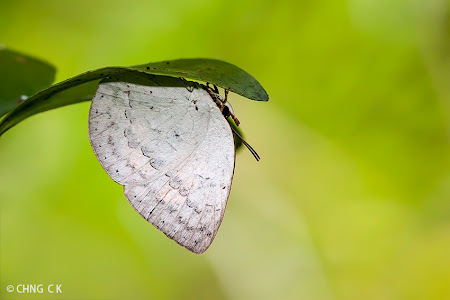 The Sumatran Sunbeam is usually found in the mangrove habitats in places like Sg Buloh Wetland Reserve, Pasir Ris Park Mangrove swamp and Pulau Ubin. 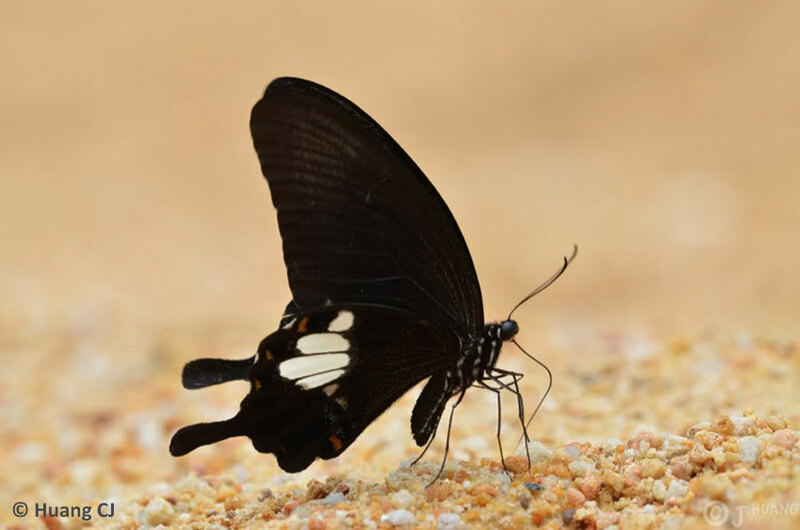 It is a fast flyer, and females are more often seen than the males of this species. 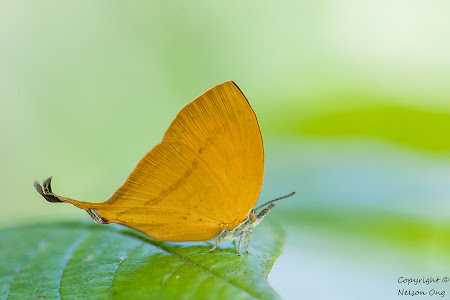 The Sumatran Sunbeam has a habit of flying rapidly, then perching on the underside of a leaf to hide. Two weekends ago, ButterflyCircle member Chng CK managed to capture a shot of this species, perched on the underside of a leaf with its wings folded upright. 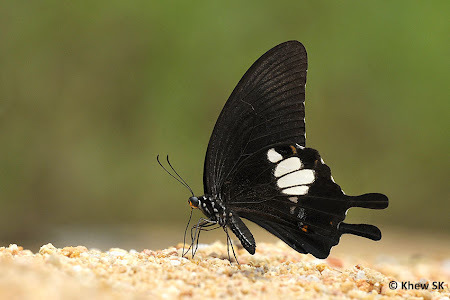 A colony of the White Banded Flat was re-discovered in Singapore by Nelson Ong and Yiming some time back in Feb 2011. 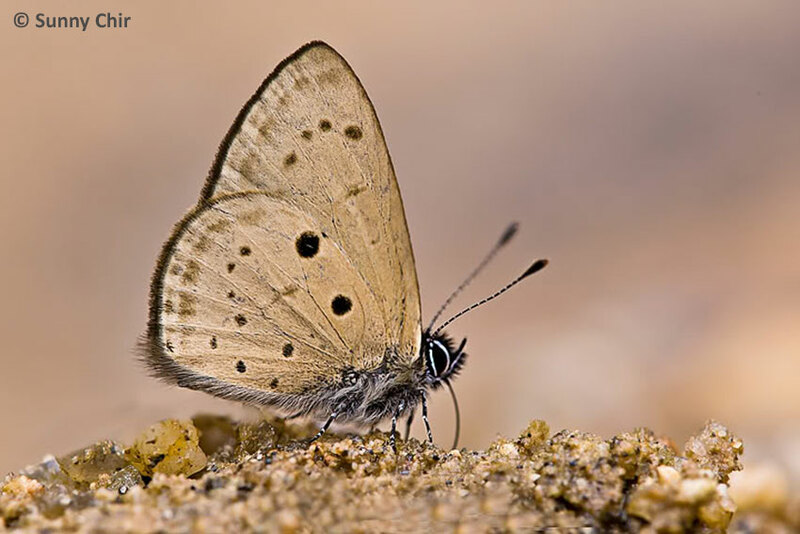 Until then, it had been assumed that this species, recorded in the checklists of the early authors, was extinct. The surprising find ensured that the White Banded Flat would be re-instated to the Singapore Checklist once again. Last week, ButterflyCircle member Sunny Chir shot the White Banded Flat at its very local hideout. 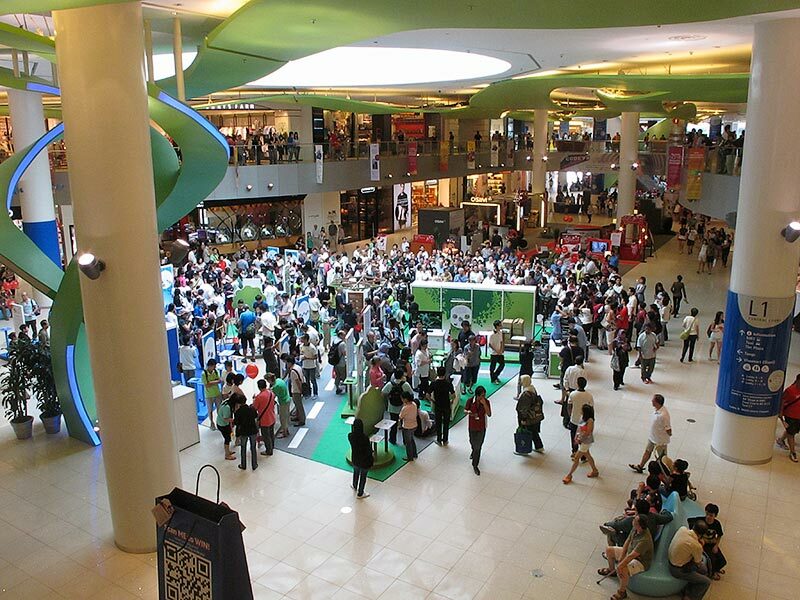 We are glad to know that the colony still thrives and does not appear to be in danger of disappearing just yet. 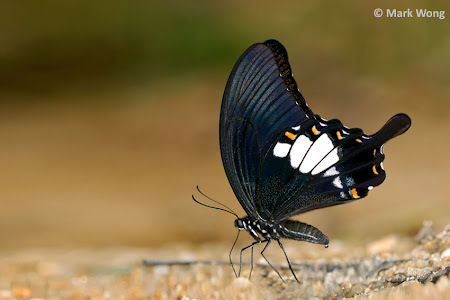 But its existence in the Singapore butterfly list remains highly threatened. 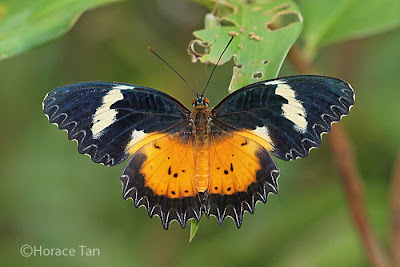 An earlier version of the life history of the Malay Lacewing can be viewed by clicking this link. 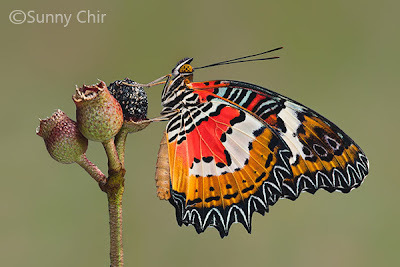 A female Malay Lacewing showing its underside. 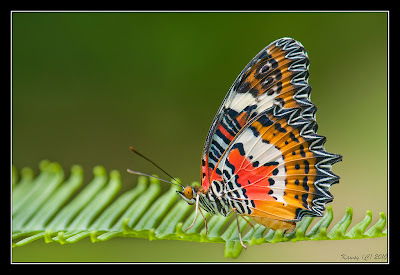 A female Malay Lacewing showing its upperside. 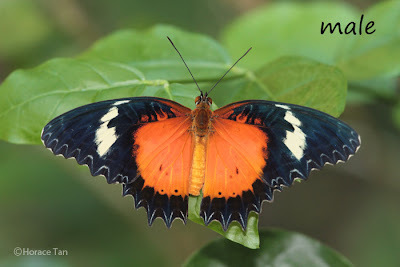 Above, the forewings are black with a white subapical band beyond the cell; the basal area is orange-red for the male (with the red confined to the base of the wings) and black for the female (with a yellowish-white patch in mid space 1b). 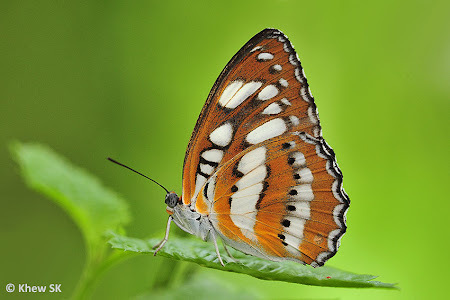 The hindwing is entirely orange-red (paler in the female) except for the scalloped black distal border. 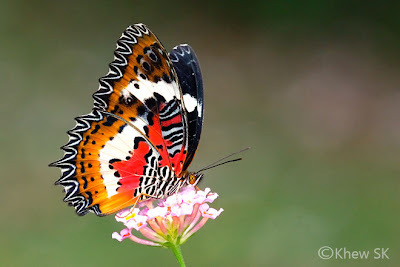 Underneath, the wings are orange-red with white fasciae and adorned with black spots. The forewing cell has several black-edged, pale blue transverse stripes. 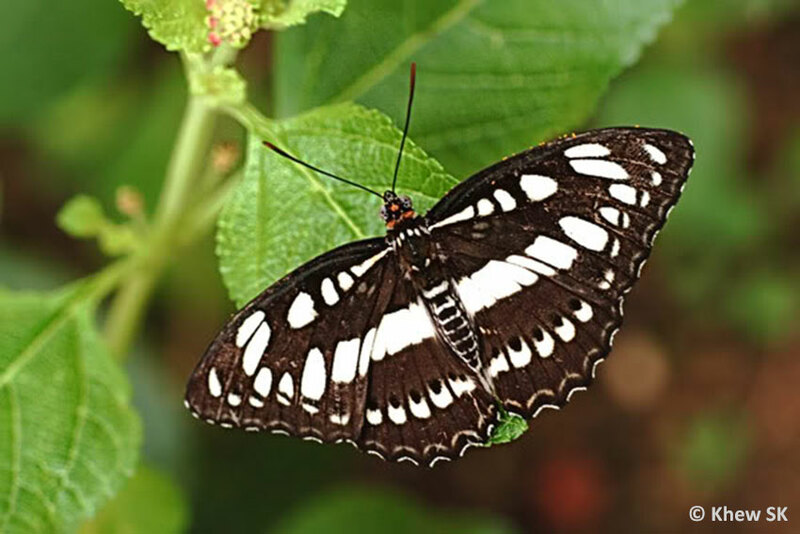 The wing borders are dark coloured and deeply indented with lace-like pattern of white markings. 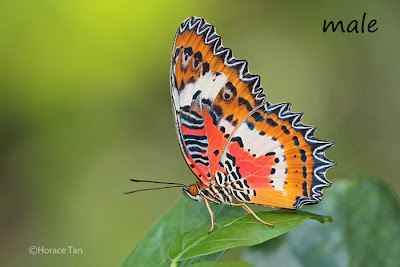 One distinguishing feature to separate Malay Lacewing from other Cethosia species is the absence of a white submarginal band on the hindwing underside. A male Malay Lacewing showing its underside. A male Malay Lacewing showing its upperside. The Malay Lacewing is essentially a forest dweller and its local occurrence is confined within the sanctuary of the nature reserves in the catchment areas. 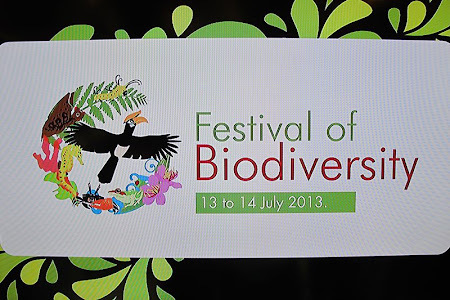 It is not uncommon in the reserves, and adults can be spotted visiting flowers of flowering plants such as Leea indica in forest clearings or alongside forest trails. 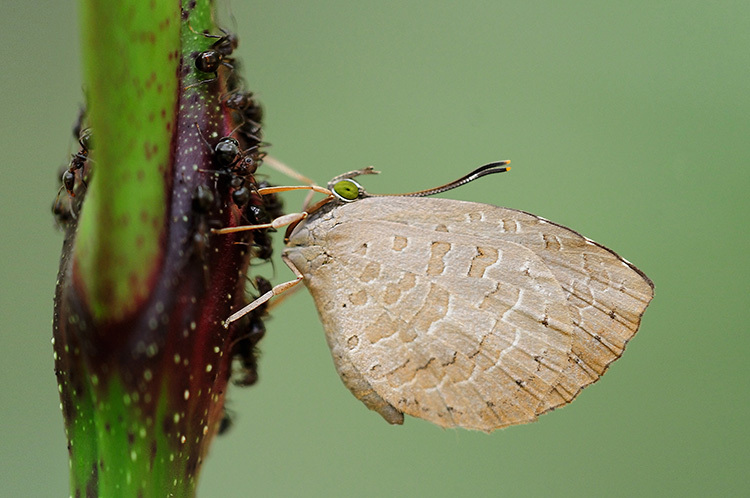 At times, females can also be seen checking out leaves of various plants in search of an ovipositing site. This small butterfly, known as the Singleton, was recorded in the checklists of the early collectors and the authors of the two main reference books on butterflies of Malaysia and Singapore. 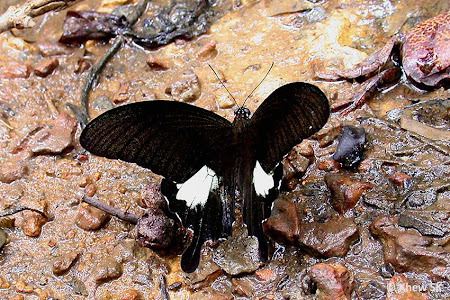 The male of the Singleton is deep brownish purple above, whilst the female is lighter but has a broad border on both wings. 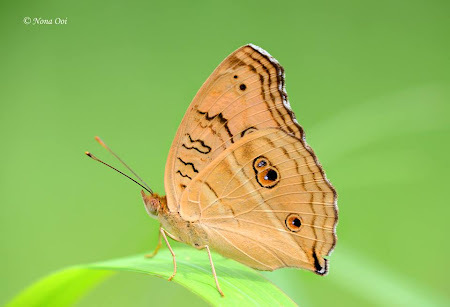 The underside is pale buff brown with prominent black spots on both wings. 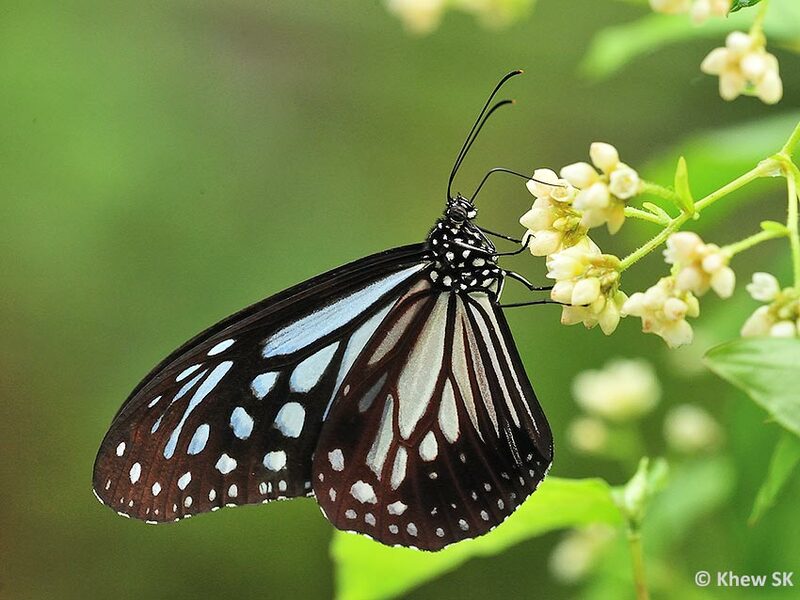 It is not known why the butterfly disappeared from Singapore, or when it did. 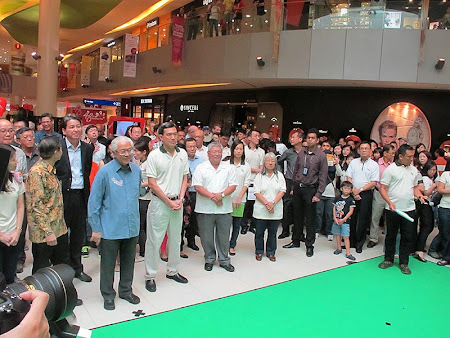 It is reported that the Singleton is nowhere considered common, even in Malaysia. However, on ButterflyCircle members' trips up north, males of this species are quite regularly encountered puddling on damp riverbanks. 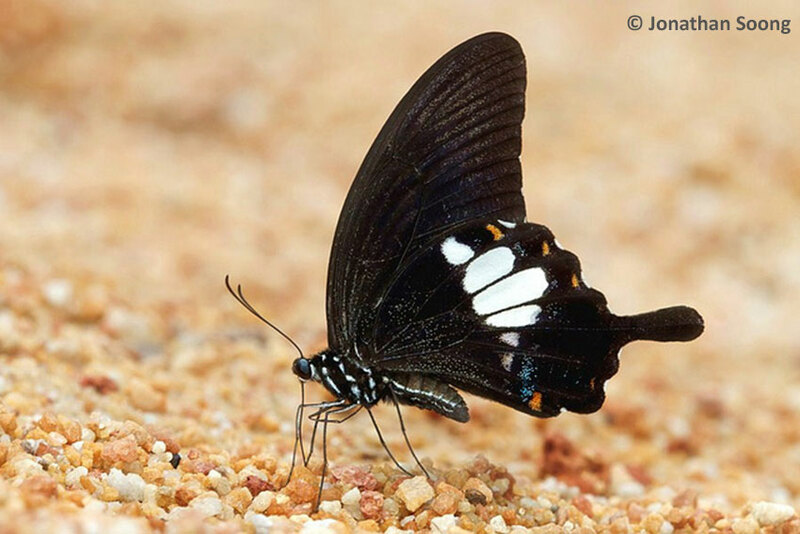 In looking back at the numerous butterfly surveys in Singapore, starting in the early 1990s, no one has thus far seen the Singleton. Will it be back here again one day? 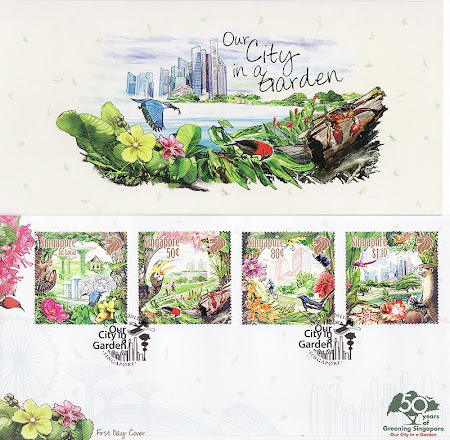 Or will it remain only in our memories and is gone forever from Singapore? 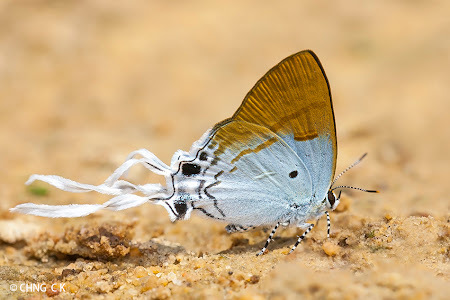 Amongst the three species of the genus Catopsilia in Singapore, the Orange Emigrant gets my vote for being the prettiest of the three. 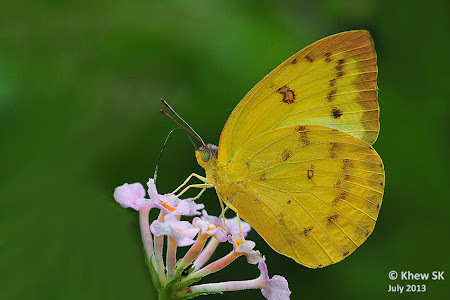 Fast-flying and erratic in flight, this Pierid is common and more so whenever its caterpillar host plants, Senna fistula and Senna surattensis are cultivated. The underside of the Orange Emigrant is orange-yellow with brown markings. 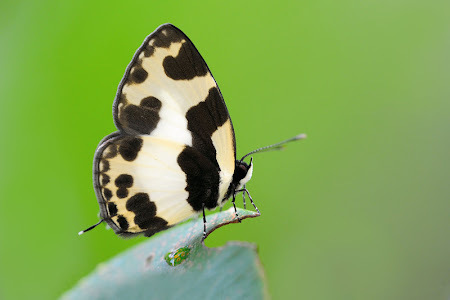 The upperside of the forewings is white with black borders whilst the hindwings are orange-yellow. 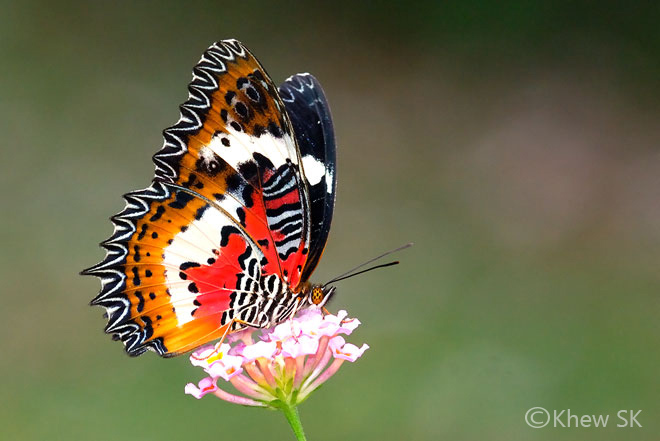 This Orange Emigrant is feeding on the flower of the Lantana, an all-time favourite nectaring plant for butterflies. The pink variety, shown here, is less popular with butterflies compared to the orange and red varieties. The proboscis of the butterfly can be seen coated with pollen from the stamens of the flower. 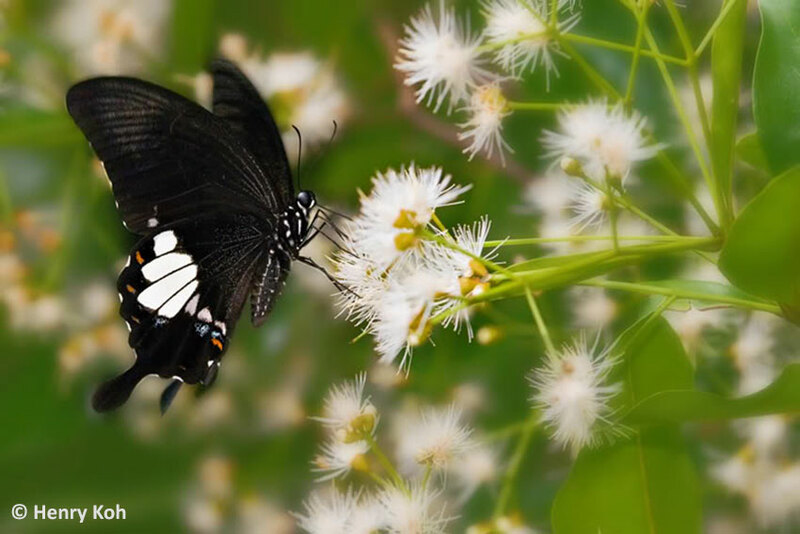 Butterflies are good pollinators of flowering plants when they go about feeding on nectar from the flowers. The Peacock Pansy is one of four Pansies found in Singapore. Sun-loving butterflies, all the four belong to the genus Junonia, of which there are six species in the Southeast Asian region. Two of them, the Lemon Pansy and the Yellow Pansy are not found this far south. In flight, the Pansies are fast on the wing and adopt a rapid gliding flight. 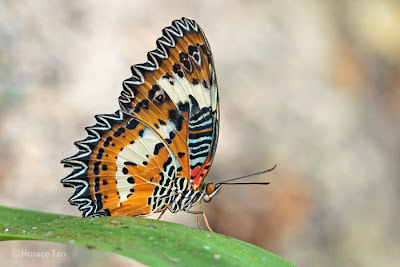 The Peacock Pansy is predominantly orange with large eyespots adorning both wings. 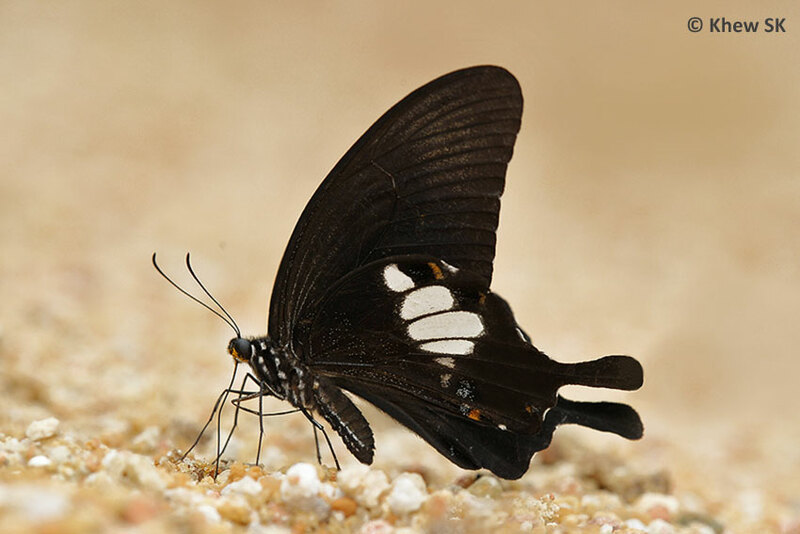 The underside is paler with the same markings and ocelli as the upperside. The caterpillars of this species feed on the Creeping Ruellia (Ruellia repens). The species is fairly common and usually found in open grassy areas. 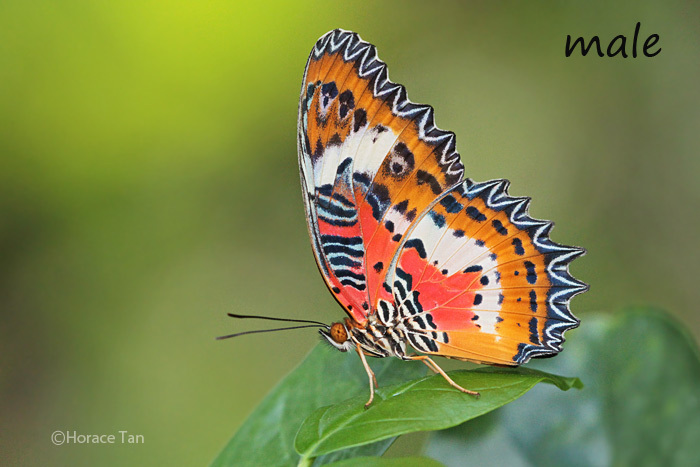 This perching Peacock Pansy was shot by ButterflyCircle member Nona Ooi last weekend. 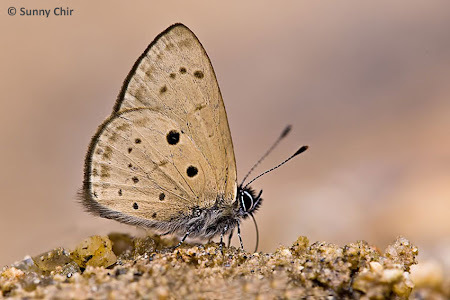 This long-tailed Lycaenid, or Hairstreak, is moderately common and widespread in distribution. 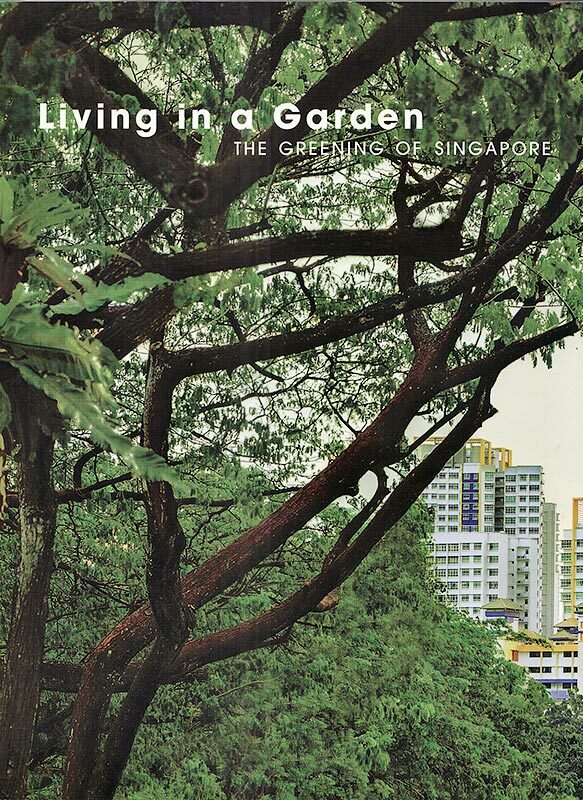 It can be found in urban parks and gardens as well as in the sanctuary of Singapore's forested nature reserves. It can fly quite rapidly amongst the treetops but comes down to the forest floor to puddle occasionally. In the nature reserves it likes to feed on the flowers of the Bandicoot Cherry (Leea indica). 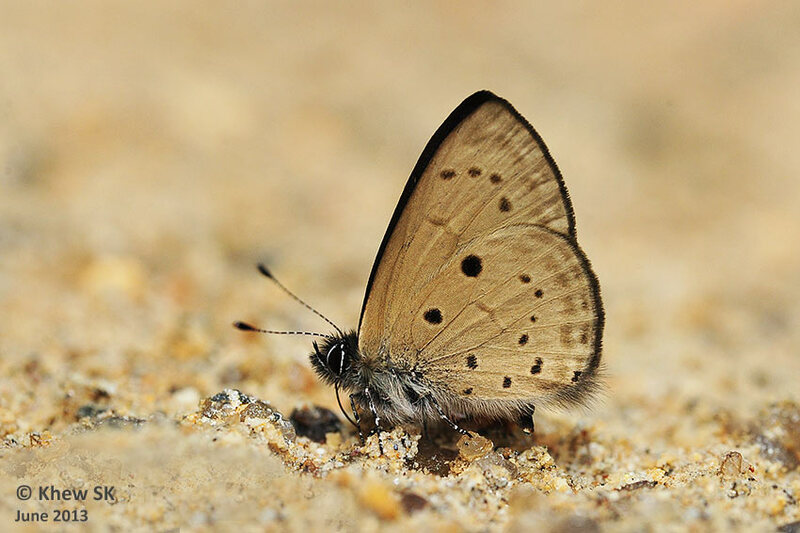 Males are regularly observed to puddle at moist sandbanks in the nature reserves. 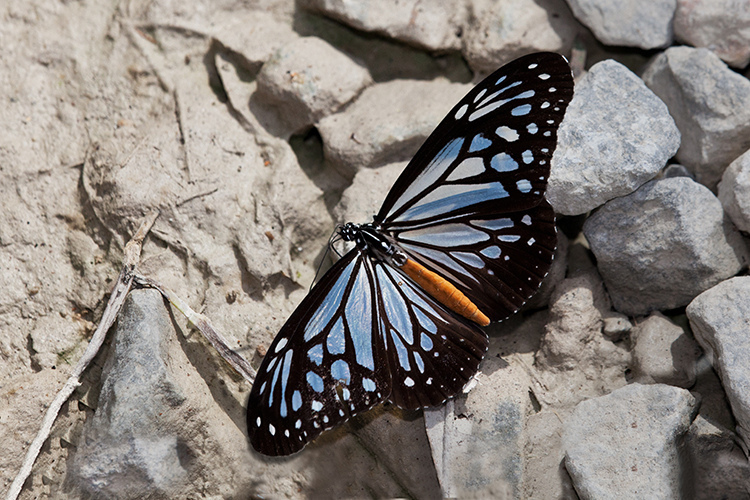 This individual was shot puddling by ButterflyCircle member Chng CK at the Dairy Farm Nature Park recently. Note the long white twirling tails and the shorter pair along the vein beside it. There is a characteristic prominent rounded black spot at the base of space 7 on the hindwing. 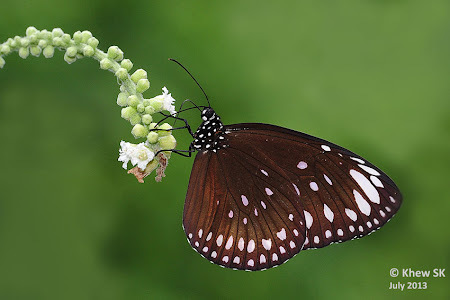 This relatively large Danainae, the Chocolate Tiger (Parantica melaneus sinopion) is common in Malaysia, particularly at higher elevations like the hill resorts at Fraser's Hill and Penang Hill. Often, they fly in the company of other Danainae, feeding on wild flowers. 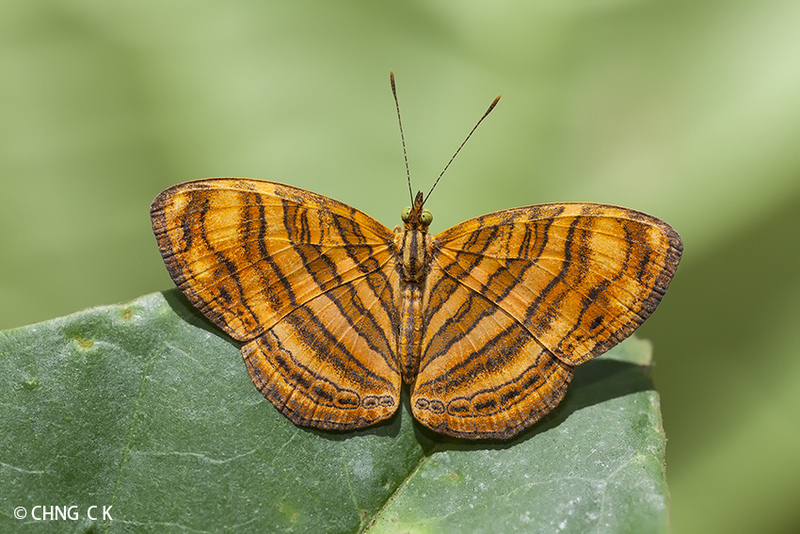 The Chocolate Tiger has a slow and unhurried flight but can be skittish if approached too quickly. 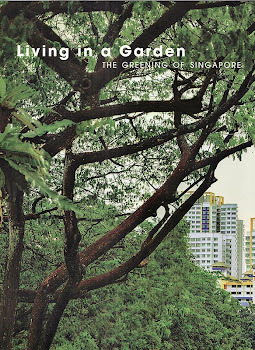 It was recorded from Singapore by the early authors like W.A. Fleming but has not been seen for a long time. Like many of the Danainae, the caterpillar host plant is probably one of the not uncommon lactiferous plants (probably from the Asclepiaceae family) that still grow in our forests. 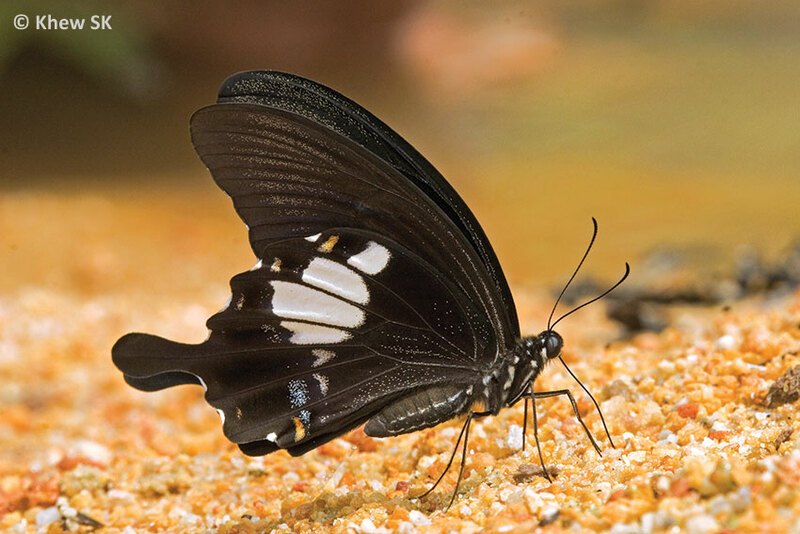 The wings of the Chocolate Tiger are bluish grey with the veins and wing borders coloured a dark chocolate brown. The abdomen of the butterfly is light orange-brown and prominent when it is in flight. Will it be seen back here again one day? Or will it remain only in our memories and is gone forever from Singapore? This fast-flying "swallowtail" butterfly is always a crowd-pleaser whenever it appears. 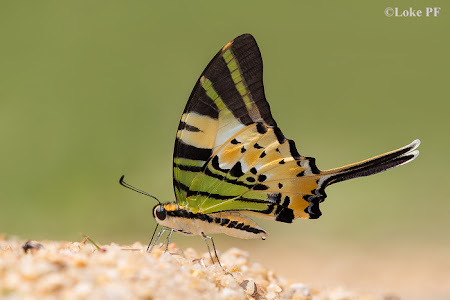 Usually easier to approach and photograph when it is puddling, the Five Bar Swordtail is unique in the sense that its long tails taper off in a sword-like shape. 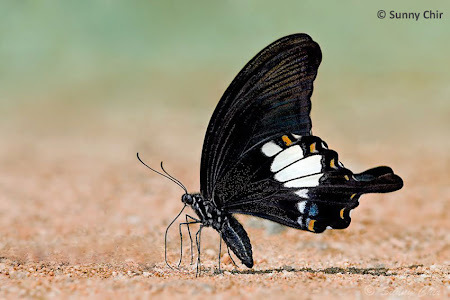 The colours on the undersides of the wings are also an attractive blend of black, white, yellow and green. This well-executed shot of the Five Bar Swordtail was taken by ButterflyCircle member Loke PF last weekend at the Dairy Farm Nature Park. 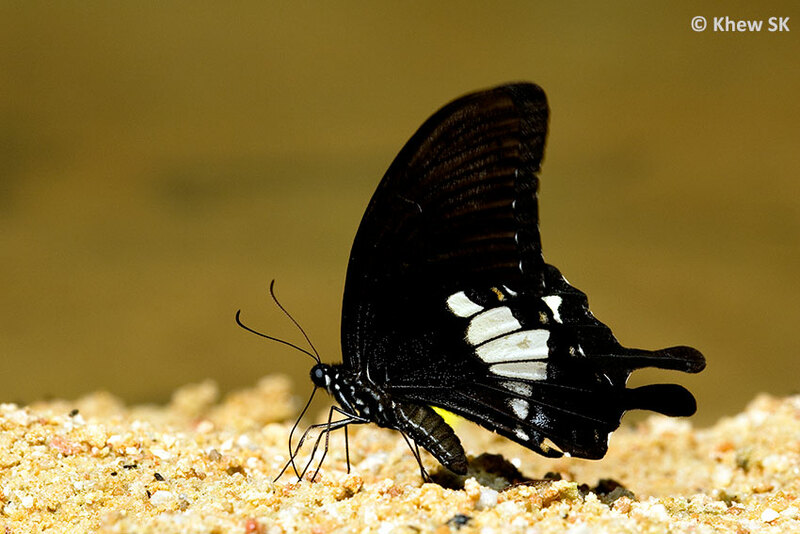 The puddling butterfly's colours are brought out effectively on a clear background of pastel green. 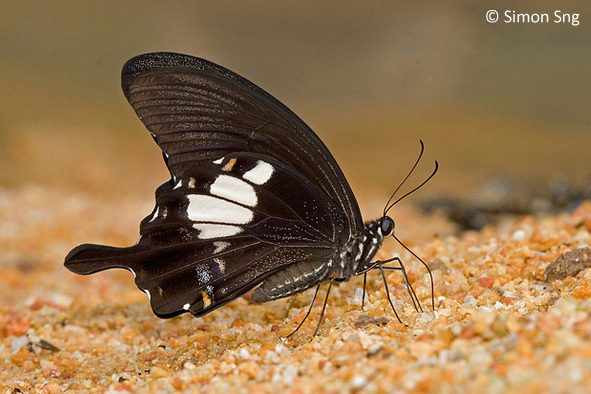 Note also the little bubble of pee at the tip of the butterfly's abdomen. 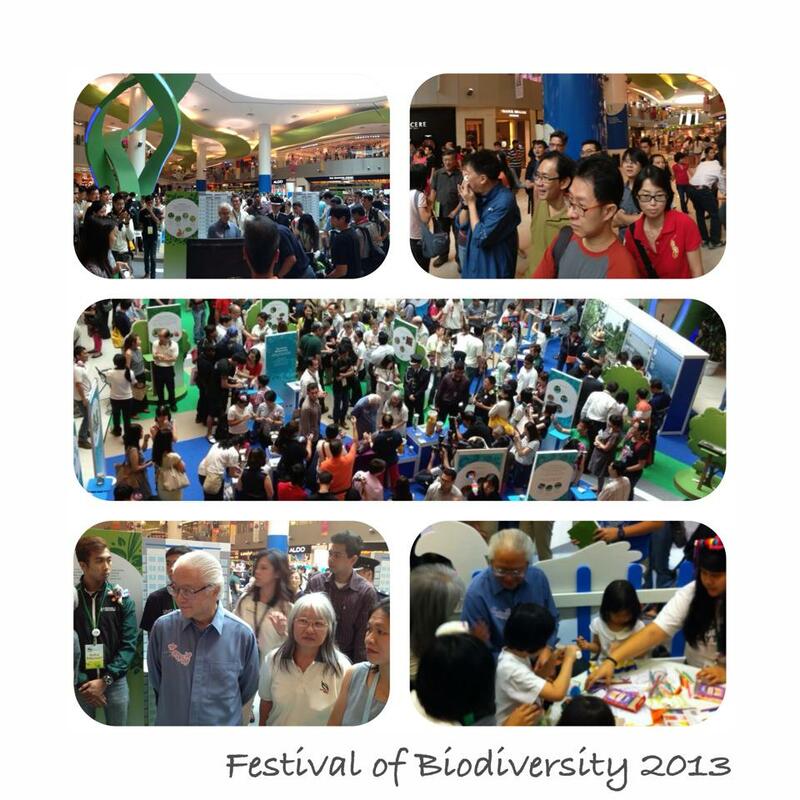 The Festival of Biodiversity 2013! The Festival of Biodiversity (FOB) is an annual event organized by the National Parks Board in collaboration with the Biodiversity Roundtable. It first started in 2012 and was held at the Singapore Botanic Gardens. The FOB an event to celebrate Singapore’s natural heritage to bring about greater awareness of the rich biodiversity in Singapore. 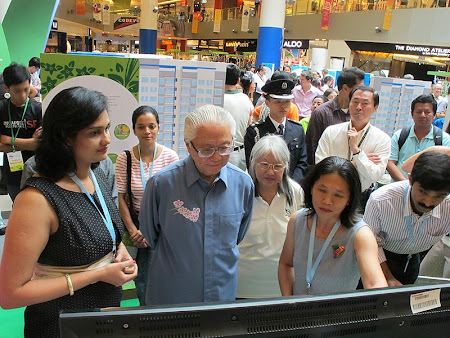 ButterflyCircle is a partner and a member of the Biodiversity Roundtable. Last year, ButterflyCircle featured a collage of our members' work at our booth. We also launched our book, "Caterpillars of Singapore's Butterflies". See the blog article here. This year, ButterflyCircle will be doing a video clip showcasing our members' work and ButterflyCircle's objectives, activities and contributions to promoting butterfly conservation and education in Singapore. 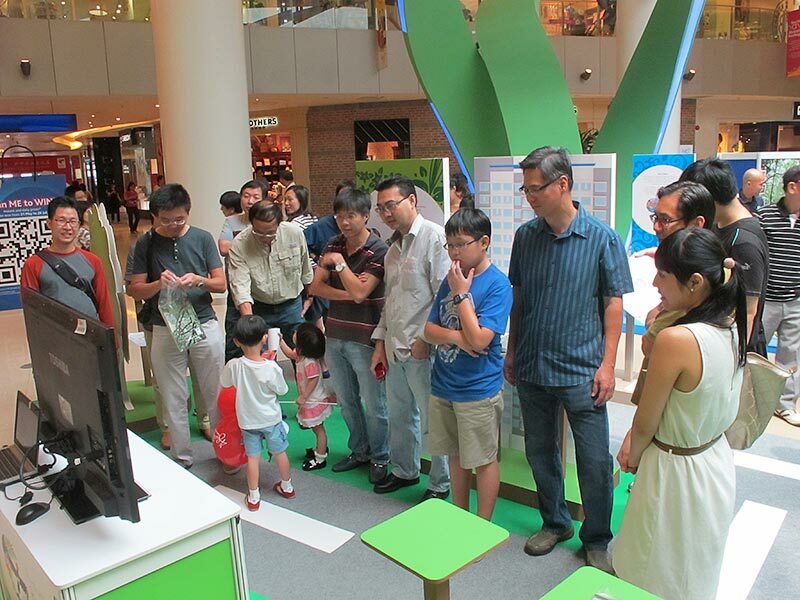 The video clip will be played on a 40" LCD screen at the exhibition area of the FOB. There will be activities for the family! 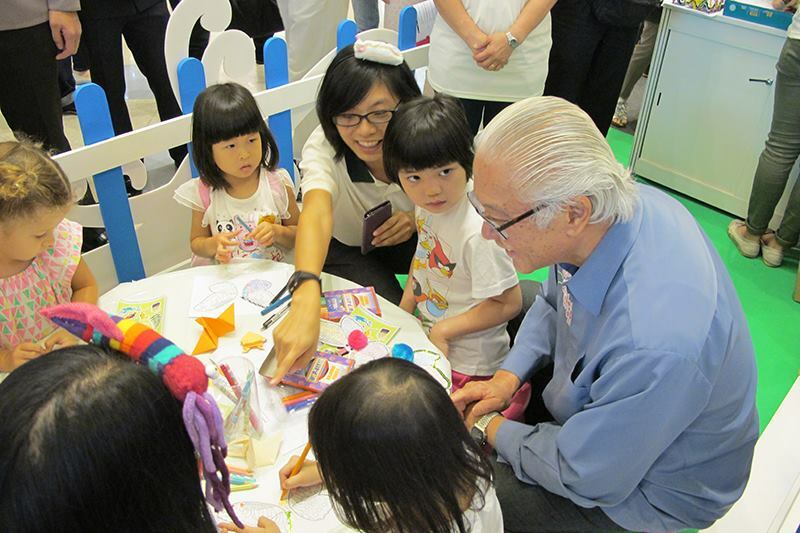 Nature workshops are free on a first-come-first-served basis. 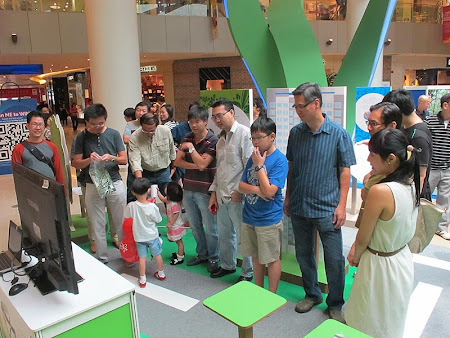 There will also be several exhibitions (i.e. 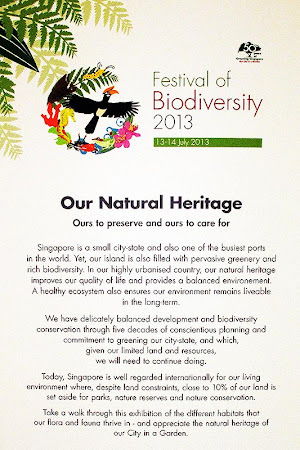 'Our Natural Heritage', 'Animals Specimens Showcase', 'Year of the Snakes in Singapore 2013'). The FOB will be held at Vivo City (Level 1 Central court B & West Boulevard) on the 13th & 14th of July (Sat & Sun) from 10am to 10pm. 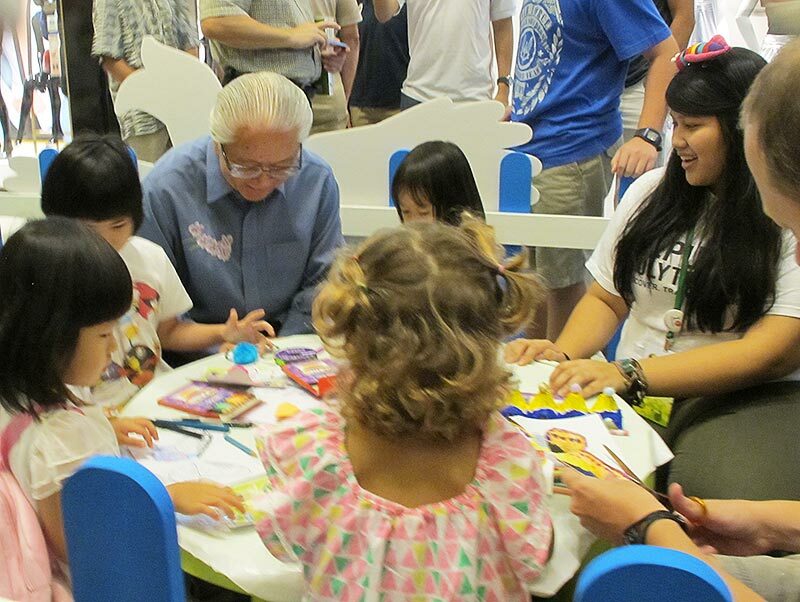 The launch will be at 11:30am on Saturday and President Tony Tan will be the Guest of Honour! All ButterflyCircle members are welcomed to join in for the Launch/Opening Ceremony at 11:30am at Vivocity. 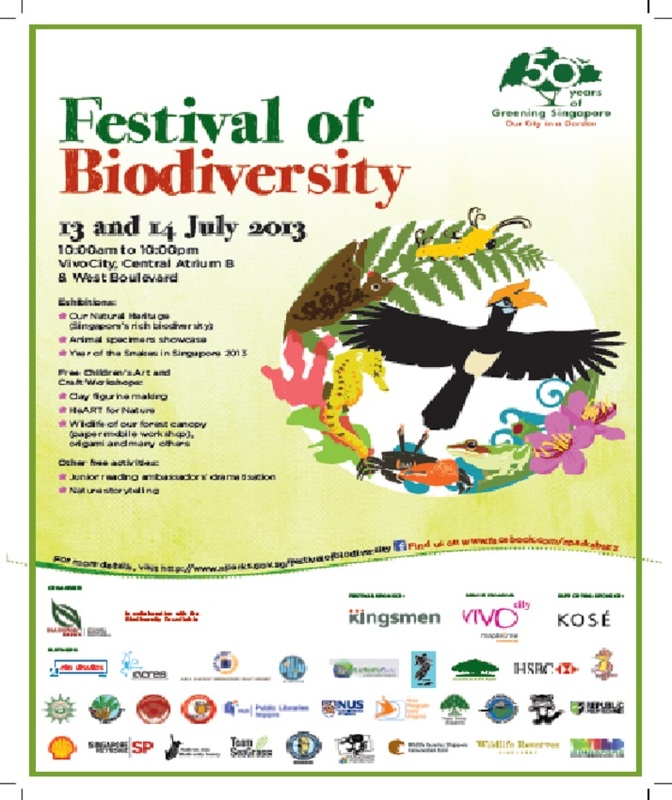 See you there on Saturday!